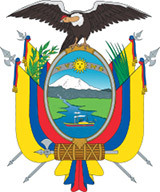 Although Ecuador has been independent since 1830, the birth of the modern Ecuadorian Army dates from the presidency of Eloy Alfaro (1895–1911). During this period, the French officers originally engaged to train the Army were replaced by an important Chilean military mission (1903). 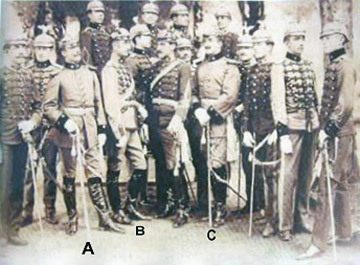 The Chileans, heavily influenced by German military doctrine, naturally recommended German equipment and uniforms, which the Ecuadorians eventually imported from the Reich of Wilhelm II. The Law of November 7, 1905, organized the armed forces along German guidelines, and the German Pickelhaube M95 became the standard parade headgear for the officers of the Army. Beginning in 1922, the same year Benito Mussolini came to power, an Italian military mission (Italy was among the Allies during the First World War) arrived in Ecuador, and the German influence on military procurement for the small Ecuadorian army of 6000 men subsequently faded. The Pickelhaube was, nevertheless, retained as the main ceremonial headgear, and a large number of these helmets were purchased from neighboring Venezuela, which was in the process of abandoning the Pickelhaube. For ceremonial parades, army cadets sported a Haarbush of different colors (blue, red, or white) according to the military specialty. The spike was replaced by a flying condor for general officers. The Italian influence on the Ecuadorian General Staff was substantial, and consequently, Quito purchased an important quantity of Italian equipment in 1938, including the M15 Adrian, leftover from the First World War, but mostly the new high-tech M33. These helmets, painted in dark green, were sometimes decorated with the national cockade in red, blue and yellow. When Italy joined the Axis powers in 1940, Washington began pressuring the government in Quito, and subsequently, quantities of US military equipment began arriving. 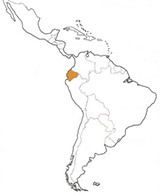 In 1941 Peruvian troops invaded Ecuador, with the result that Ecuador lost almost half its territory. During this conflict, the Italian helmets were extensively used, though Ecuadorian paratroops did not use helmets. After 1942 the US delivered quantities of the M1917-A1, which briefly became the official helmet of the Ecuadorian army. No emblems were worn on this headgear. In 1943 the US M1 was first introduced, and it rapidly replaced the old Brodies. The US M1 helmet liner was frequently used with a variety of emblems, including the national flag, as in the case of the Honor Guard at the National Military Shrine (Templo de la Patria) . In the late 1980s M1 metal clones were imported from abroad, probably from Germany. Since the 1990s a locally made version of the PASGT has been issued to most of the armed forces, including paratroops. Armored vehicle crew members currently wear the US DH-132 CVC model headgear.